X-Treme Shooting Products will roll out a new series of Titanium-bodied receivers at SHOT Show 2011 in Las Vegas. These new repeater actions will come in three (3) sizes: Short Action (SA), Long Action (LA), and .338 Lapua Magnum. The Short Action and Long Action versions have a Rem 700 footprint so that they should fit any stock with Rem 700 inletting. The .338 version has been designed to fit the Accuracy International AICS CIP (large) chassis system — providing a perfect “drop-in” solution for tactical shooters looking to upgrade to the .338 LM. X-Treme Shooting is currently the only US-based company offering custom Titanium actions for the general public. X-Treme Shooting’s new Ti actions feature a body CNC-milled from titanium billet, fitted with a conventional steel bolt. Even with the steel bolt, all the Titanium actions are significantly lighter than equivalent chrome-moly or stainless steel actions. The Titanium Short Action should be nearly 1/2-pound lighter than a steel action, while the Ti Long Action should be 10 oz. lighter than steel. 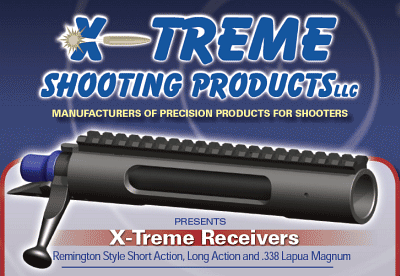 The .338 LM action will be “much lighter than steel” according to Tom Myers of X-Treme Shooting. At SHOT Show, X-Treme Shooting will display the first production runs of titanium Short Actions and Long Actions. These will be priced at $1350.00. Price has not yet been set for the bigger .338 actions. All these actions are constructed as repeaters with bottom cut-outs for internal magazines. The Short Action and Long Action will work with standard Remington bottom metal. In the second half of 2011, X-Treme Shooting may offer solid-bottom versions of these actions for benchrest use. Why Titanium? In addition to being much lighter than steel (by volume), Titanium is extremely strong, and very corrosion-resistant. That is why it is used for critical parts in jet airplanes and spacecraft. Titanium is as strong as steel, but 45% lighter. It is 60% heavier than aluminum, but twice as strong. Titanium has the highest strength to weight ratio of any common metal. Titanium does requires special milling tools and techniques for production. However, it is otherwise a near-perfect material for rifle actions because it is light, strong, and corrosion-resistant. Weight-conscious benchrest shooters have wanted a benchrest-grade Titanium action for some time. Shedding a half a pound is huge when you’re trying to build a Light Varmint at 10.5 pounds including scope and rings. In response to this demand, X-Treme Shooting hopes to offer solid-bottom Titanium actions for benchrest use. Look for these to appear in the second half of 2011. In addition, X-Treme Shooting plans to offer a line of custom actions made from super-high-quality 17-4 stainless. CLICK HERE for X-Treme Shooting Titanium Action Brochure (PDF). 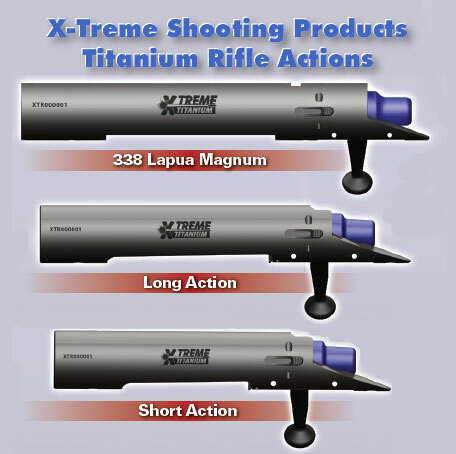 To learn more about these new Titanium actions, or to order, call (513) 313-3464 or email ctmyers [at] x-tremeshooting.com. View other X-Treme Shooting products at X-TremeShooting.com. Share the post "X-Treme Shooting Products Unveils New Titanium Actions"
I thought the bolt was a PTG. Either way , they`re different on the website. What’s there booth number for shot show? I would like to check’em out while I’m there. Strength, tolerances etc is equal to custom actions in the market, it should be great to see the manufacturer makes single shot configuration for BR use. It really doesn’t have to be in Rem700 footprint for BR use but a “rectangular” base (beefy yet light) such as Panda & Viper, which is much better for glue in. In addition to reduce weight (and maybe for interchangeable bolt head), how about “separate” bolt head such as Savage? (bolt head can be by 4140/4340 and the bolt body & handle by the same Ti w/ hard coating). These receivers should make up into some very light mountain rifles. Will be interesting to see what custom gunsmiths make of them. Very nice! Our intended target is the high end light weight hunter and the tactical market. I hadn’t thought of benchrest much but if there was a demand, we would certainly make some changes to accommodate. We’ve been in the Ti receiver business for 10yrs now, just not for our retail commercial sales. We’ve got most of the nuances of working with Ti figured out. Now if we could just get the raw material prices down. As for Shot, unfortunately we were far to late in the year to get a booth. We will be there all days and have receivers handy for “show and tell” so grab me if you see me. Bigger plans to exhibit at the NRA Show and next Shot.